2Mx3M/6.5x10ft Background Support System. Easy to setup,durable and portable. ●The entire construction of the support stand is made of premium aluminum. alloy.It is both durable and lightweight. The 3-leg triangle support ensures safety when in use. ●Only takes a few minutes to set up, no extra tools needed, the CRAPHY Backdrop stand serves as your best photographic accessory. ●Also comes with a well-made oxford fabric carrying bag, you can easily take it to different sites for various projects without a hassle. 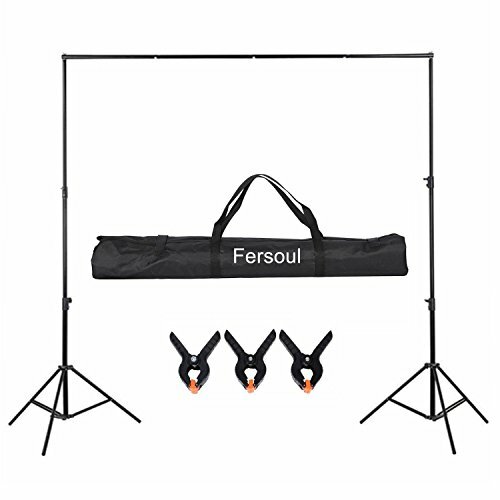 Adjustable height : 31" / 31.50" to 7" / 78.74"
★Advanced aluminum alloy construction for durability and portability. ★Easy to set up and convenient to store with a portable carrying bag. ★Good Flexibility with Width (3.84 ft.-10 ft.) & Height (2.6 ft.-6.58 ft.) Adjustment. ★Photo Video Studio Holds muslin, canvas and most other photographic backdrops with 3 Photo Clamp.Max Load Capacity 30Lbs.Great to use in studio or at home for portraits, product and still life photography. If you have any questions about this product by Fersoul, contact us by completing and submitting the form below. If you are looking for a specif part number, please include it with your message.